In 1959, at age 16 Robert C. Gueriera, Sr. took a neighborhood roofing business over from his father, Charles Gueriera. Robert then took a business that had predominantly worked in the Overbrook section of Philadelphia and grew it significantly. Specializing in 4 Ply BUR Roofing Systems on mostly residential homes, Robert quickly became a master mechanic and skilled businessman. The business office and shop were moved to Broomall by the mid-1970s. This move enabled the business to expand while still focusing on the low slope (flat) industry. Recently the business has expanded even more, and we have moved to West Chester, PA. This has allowed us to concentrate our interests on all types of low slope applications both industrial and commercial. Our single-ply certifications which include EPDM and TPO are through the well-respected Carlisle/Syntec Company. Our Built-Up and Modified Bitumen Systems are certified through the GAF Corporation. Our training and certification with these strong manufacturers, enables us the opportunity to issue an NDL (No Dollar Limit) Warranty through the manufactures for up to 20 Years. If you are looking for professional or commercial epdm flat roof structure repair in Chester State, Gueriera Roofing is the only choice for full-service, low cost roof repair. With our fully certified and professionally certified roofer experts, we can repair or replace any commercial roof. Contact us today towards your free estimate and see why Gueriera Roofing is the only option for commercial roofing repair in the Chester County Area. Happen to be you searching for a dependable, affordable roofer in Chester State? Gueriera Roofing has been providing high quality commericla, industiral and residential roofer work in the Chester County area since 1959. Whether you are looking to use a new metal roof, need your roof structure repaired or simply want a free estimate, Gueriera Roofing can help you! We are fully accredited and covered by insurance roofers with a proven record of high quality service and competitive prices. EPDM is a high grade rubber roofing most commonly used in commercial and professional roofing. EPDM can withstand extreme weather and temperature changes, and can expand and contract without compromising the waterproofing system. By fastening the tissue layer to the roof with adhesive, we can completely seal your roof. If you are looking for professional or commercial epdm flat roof structure repair in Chester County, Gueriera Roofing is the only choice for full-service, low cost roof repair. With our fully accredited and professionally certified roofing experts, we can repair or replace any commercial roof. Contact us today to get your free estimate and see why Gueriera Roofing is the only option for commercial roofing repair in the Chester County Area. Happen to be you buying dependable, affordable roofer in Chester State? Gueriera Roofing has been providing high quality commericla, industiral and residential roof work in the Chester County area since 1959. Whether you are looking to install a new metal roof, need your roof repaired or perhaps require a free estimate, Gueriera Roofing can help you! We are fully accredited and covered by insurance roofers with a proven record of high quality service and competitive prices. 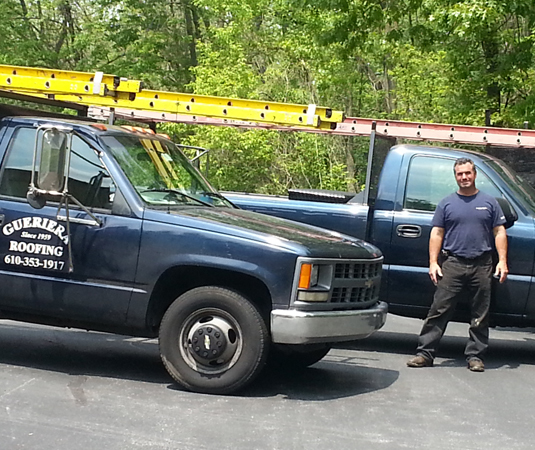 Happen to be you searching for a dependable, affordable roofer in Chester Region? Gueriera Roofing has recently been providing high quality commericla, industiral and residential roofing work in the Chester County area since late 1950s. Whether you are looking to use a new metallic roof, need your roof structure repaired or maybe require a free estimate, Gueriera Roofing can help you! We are fully qualified and insured roofers with a proven record of high quality service and competitive prices. EPDM RUBBER is a high quality rubber roofing most commonly used in commercial and professional roofing. EPDM can withstand extreme weather and temperature changes, and can expand and contract without compromising the waterproofing system. By fastening the tissue layer to the roof with adhesive, we can completely seal your roof. Should you be looking for commercial or commercial epdm flat roofing repair in Chester Region, Gueriera Roofing is the only choice for full-service, low cost roof repair. With our fully certified and professionally certified roofing experts, we can repair or replace any commercial roof. Contact us today towards your free estimate and see why Gueriera Roofing is the only option for commercial roofing repair in the Chester County Location.